February 2, 2016 By heather 1 Comment This post may contain affiliate links. Read my disclosure policy. You will score with your biggest fans when you serve these RITZ® Crackers pizzas and Coco-Cola ice cream floats at your next football party. I come from a football lovin family. Everyone in the family is a huge football fan, even my grandmother. She doesn’t miss watching a game. We have so much fun having family and friends over, cheering for our teams and of course eating some yummy snacks. I will admit, we get a little depressed when there is only one football game left in the season. For this last Big Game, I thought it would be fun to decorate a mason jar glass with football laces. They are easy to make, you only need scissors, a glass and some white tape. Begin by cutting your tape in half and about 3 inches long, place it down the center of the glass, and then cut little strips to make the laces. SCORE, on to the main event. 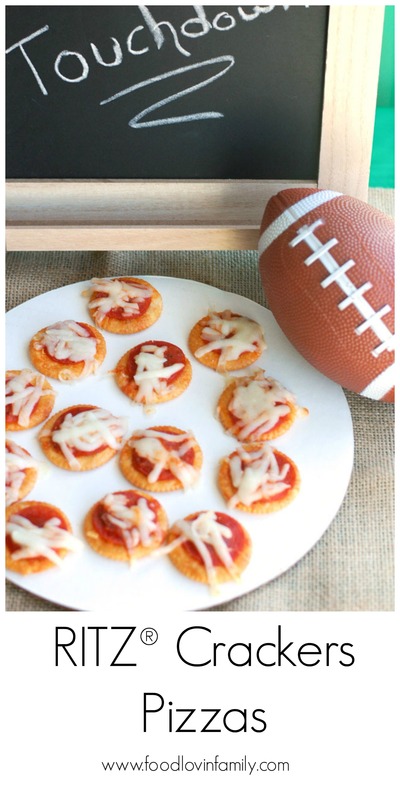 For game time I want to serve RITZ® Crackers pizzas. They are a great snack with lots of pizza flavor. I love making these when people come over because they are easy to put together, even easier to eat, and they always go fast. Most of the time we have a box of RITZ® Crackers in our pantry but when I went to look this time, they were all gone, another trip to Walmart. At the store I grabbed my box of crackers and then noticed they have all Coca-Cola 500ml 6-packs on sale 2 for $5.00 through game time. I decided to grab some Coca-Cola Coke Zero bottles to make Coke Zero ice cream floats to go in my mason jar glasses, score! Lets assemble the RITZ® Crackers pizzas. All you need are four ingredients: RITZ® Crackers, pizza sauce, pepperoni, and cheese. Line a baking sheet with aluminum foil and spray with non-stick cooking spray. Place one pepperoni on top of the RITZ® Cracker, then put about 1 teaspoon of pizza sauce on top and sprinkle with cheese. Place under the broiler for 2-3 minutes for the cheese to melt and they are done. Everyone will love these RITZ® Crackers pizzas. They are a great addition to a fun filled football party. Take it to the house with these pizzas and Coca-Cola Coke Zero floats. To find more football party ideas with Coca-Cola and RITZ®, check out SnacksandSips.net Also be sure to check out RITZ® crackers Pinterest page for more great topping suggestions. Quick and easy 4 ingredient snack, sure to please your whole family. Place RITZ® Crackers on baking sheet. Top each cracker with a pepperoni slice, and then 1 teaspoon of sauce on top of the pepperoni. Place baking sheet in oven and broil for 2-3 minutes, until cheese is melted.